Daphne Odjig was nick-named "Picasso's grandmother" by Norval Morrisseau because he considered her artistic style part Woodlands Native and part European influenced. Daphne Odjig Beavon's father was Ojibway from Manitoulin Island in Ontario, and her mother European so her influences and upbringing were mixed. 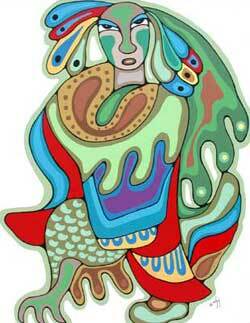 It was reflected in her art which was part abstract, part traditional native, sometimes Cubist and Surreal. Like Emily Carr to the Group of Seven, Daphne Odjig was the female part of what was referred to as "Canada's Woodlands School of Art" or "Canada's Native Group of Seven". Her subjects often dealt with family and harmony and love, the gentler, more maternal side of Woodlands Legend style of art. She is an active member of The prestigious RCA (Royal Commission of Artists). Her work hangs in major galleries around the world. She currently resides in the British Columbia interior. Her colourful prints and small originals can be found on Redkettle site. Daphne Odjig was presented with the Order of BC and received the Govenor's General Award for The Visual Arts. A show of her major works in 2008 at the National Gallery was a major artistic event. Her work was featured at the Smithsonian, in Washington, D.C.